It rises with the morning sun; it sets in the evening horizon. It embraces the morning with courage and confidence, undeterred by the varied events that occur, and it sleeps through the night in relaxation, assured that the world will be kept safe in the moon�s arms. It emits the indiscriminate feeling of warmth and security to the inhabitants of its revolving planets, yet it has lately become as cold as the chilling night, lying in wait for someone...anyone...to return the tender kindness it has emitted for as long as it existed. For Topaz to be in acceptance, one must be willing to strive toward the incoming dawn, casting away all doubt and eliminating any fear that beckons one to fall into the darkness. To become Topaz is to shine in full radiance and become the light of dawn. Despite what the statistics say at the moment, both C.C. and Saber are virtually dead even in terms of strength. At the point of their respective match last year, both candidates were even in votes attained, despite the fact that Saber was 6 wins behind C.C. The overlooked match turned out to be a thrilling one, with C.C. barely edging Saber by only 5 votes. Today, both candidates come into this match with the same voter strength, and despite Saber having one more win on her current record, there is no absolute favorite in this match. As Saber will not be entering future Japan and Korea yearly tournaments, this match could lead into a birth of an ISML-centered rivalry. With the road to Topaz only beginning, which one of these deserving candidates could be knocked out of the running this early? Although Nagato Yuki was one of the Elite 8 from the last season, she is still struggling at the bottom end of this year's Top 16. Having suffered two losses after only nine matches so far is disappointing for the runner-up of 2008's Tiara. Yuki is seeking a strong start in Topaz in which she will face Furude Hanyū, who carries the same record from Aquamarine Period. Hanyū would appear to be the underdog in this match, especially considering her final record last year, but she has done well to achieve her current #18 spot. With the fluctuating ranks of both candidates, the outcome of this match is still unclear. Who will triumph in Poland: Will the silent alien prove her great existence, or will she face the wrath of a transcendent deity? All of the Tier-3 Red candidates are stuck with seven difficult early draws. With Ibuki Fūko in that group, a potential Top-16 candidate who could very well head into the double-elimination rounds could possibly be left out entirely of the necklace discussion again. Fūko lost to upperclassman Fujibayashi Kyō in Aquamarine 1, and as a result, her effort to maintain her position in the Top 16 has gone unnoticed. This time, she is faced with the daunting task of dethroning recent Aquamarine winner Sakagami Tomoyo, who has always had the best record after every single match set in ISML's short period of existence. Tomoyo is one of the more feared candidates one will find in the Saimoe circuit today and for her to lose to Japan's number one would be a massive upset. Can Fūko pull it off, or will Tomoyo begin her quest to go 2 for 2 necklaces? So far Sanzen'in Nagi has picked up where she had left off, following a 6.42 win average per period with a (6-3) record. She has never been a strong contender for a necklace, but it is clear that she at least knows how to win. However, she will need to do much better than her usual if she is to defeat Aisaka Taiga, the newcomer who has had quite a start to her Saimoe career. Taiga found her rhythm early, losing only to Shana in an otherwise successful (8-1) Aquamarine campaign, but she has yet to face other candidates that are continually proving that they belong in such a prestigious contest. It's yet another showdown between two candidates voiced by the same voice actor. Which one will be left standing afterwards? Thanks to Kaito_Dash and minhtam1638 for their contributions to this Round's match descriptions. About six years have passed since Chii last participated in Saimoe Japan, but she is doing reasonably well so far, currently even in wins and losses. However, all of her wins up to this point have been against candidates who haven�t found much success this season. Here Chii has a chance to topple a famous name in Saimoe, 2006 Saimoe Japan champion Suiseiseki, who was able to avoid (on the plus side) an even record after Topaz 1. The popular Rozen doll famous for her desu meme has not truly experienced the light of the necklaces, that is, has not had a (9-0) run in a necklace period. While her opponent on Friday is sure to make her dread, rumor has it that Suiseiseki isn�t too good with computers, let alone persocoms. This could mean Chii may be on a verge of an unexpected upset. It�s a battle between 17th-century craftsmanship and futuristic engineering. Which will be one step closer to a necklace? One quick glance at the win-loss column and Illyasviel von Einzbern would be expected to pick up an easy win here. In this case, one could be in danger of being wrong. Holo�s (3-6) Aquamarine campaign was virtually hamstrung by the second-toughest set of opponents a candidate has faced in that period, and the fact that she still salvaged a positive vote differential is downright inexplicable. The positive side of facing the tougher opponents early, however, is that Holo would expect easier schedules in the periods could come, and she looks to be a threat to take some of the necklaces later in the season. Still, Ilya has shown that she can win at this level, despite the lack of depth on her resume before she entered through preliminaries. She has shown that she can win on a level higher than average, and she has defeated a Saimoe champion (Suiseiseki) before. This match could very well be too close to call, and it�s time that one candidate proves she has a slight edge over another. Which candidate will that be? Fujibayashi Kyō�s twin sister barely failed to make the ISML roster this year, but CLANNAD was still able to have six candidates in this competition, tying Kanon for the most representatives from one series. The new girl is Sunohara Mei, who didn�t come into attention for many until the last episode of the first season, not to mention her own story arc in AFTER STORY. However, while CLANNAD�s main cast of five occupy a quarter of the top 20, Mei is only breaking even, and she has been trying to get into the winning side since her early first week stumble. However, she hasn�t defeated quality opponents, and certainly Tōsaka Rin is definitely a quality opponent. Rin finished last year�s regular season with a winning percentage just shy of 65%, but so far, she has performed considerably better, currently standing at 70% as well as standing as a threat to make the top 16 cutoff point by the end of the year. Warning to all: stay away from the fishes, because this could either be a massive upset waiting to happen or humiliating performance by a newcomer. So far, Kawashima Ami has been looking for answers on how to actually pull off a win in a moe contest. Despite being able to win in general, she hasn�t been able to figure out how to win against quality opponents. Tonight, if Ami is to truly begin her run at Topaz, the former model needs to figure out how to get past a shrine maiden. Unfortunately for her, Furude Rika also happens to have won Saimoe Japan 2007, topped off with two more top 16 finishes and extra original anime episodes to boot, all of which have undoubtedly helped her to run perfect with the exception of one early misstep (Hiiragi Kagami) in Aquamarine. Statistically, the chances for Ami defeating Rika are very slim, but in a contest where one event can change anything, just about anything can happen. Can Ami defy the odds, or will she be left wondering how to win for weeks to come? Thanks to minhtam1638 for his contributions to this Round's match descriptions. Not even a year has passed since these two first met in an arena emblazoned in Emerald. In that encounter, Nagato Yuki defeated Izumi Konata by 50 in a match that scored a total of about 550 points. A handful of months later, the total nearly doubled as the two met in the light of the Tiara, where in the eventual 4th place match, Yuki defeated Konata by a margin of 70. Now, in a match that is expected to score in the high 3000s, Konata is looking to finally complete the SOS-Trifecta, as she has already defeated Suzumiya Haruhi and Asahina Mikuru at least once last year, in different circumstances. Yuki, however, is trying to improve her record against Konata to (3-0) as she looks to redeem herself from a disappointing (7-2) start. For now, a win for Yuki will bring their records to even, while a win for Konata could leave Yuki in a difficult position no one would expect her to be in. The winner of this match will improve her chances of earning the Topaz necklace. Will Konata finally reverse the tides and defeat Yuki, or will this match continue to sing the same song, second verse? So far this season, Katsura Hinagiku took the early easy schedule to her advantage, pooling her success into a (10-1) record. C.C., on the other hand, has lost on three occasions so far, most notably to Saber in Topaz 1, a match that may have taken C.C. out of the Topaz conversation. Interestingly enough, however, despite their different schedules, both Hinagiku and C.C. are almost dead even in total votes received leading to what could be a dramatic third chapter in this newfound rivalry. Last season, Hinagiku and C.C. fought their way to a draw by the end of regulation, forcing an overtime match that ultimately went to C.C. 's favor. Now as the two meet once more in Jakarta, Hinagiku is searching for a quality win to prove that her stay in ISML will be long, and C.C. is looking to build some momentum and accumulate wins by the time Amethyst rolls around. Can C.C. thwart Hinagiku's Topaz chances tonight, or will Hinagiku pull this series to even? Tōsaka Rin never had a chance at Aquamarine from the start, losing to Aisaka Taiga in the season opener and ultimately finishing with a (6-3) Aquamarine record. 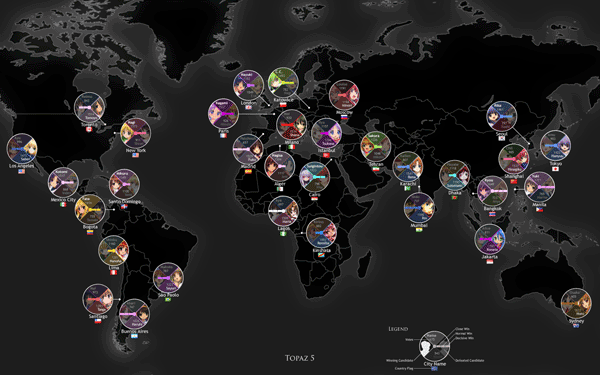 She is performing slightly better this period, winning both of her Topaz matches by an average of 600 votes. However, if she is to continue that run, she may have to defeat the one candidate that may have improved her performance more than Rin has. Furukawa Nagisa finished 22nd in the standings last year as opposed to Rin's 24th, yet she now currently ranks in the top 10 in the overall standings. She has collected 10 wins, including an unexpected upset over Hiiragi Kagami in Aquamarine 6, and she is out to prove that she too can compete as well as her schoolmates Fujibayashi Kyō and Sakagami Tomoyo, despite her well documented health problems. With both candidates undefeated in Topaz, only the winner will continue forward to claim the radiance of the sun. Can Nagisa continue to present herself as one of the candidates to beat, or can Rin send her back to reality? If Takamachi Nanoha ever wants to be on equal ground with her best friend Fate Testarossa, at least in this contest, then the young grade-school student would have to have at least one Necklace in her possession. So far, she is off to a good start, ranking 4th among the remaining undefeated Topaz candidates. Nanoha's next opponent is Sanzen'in Nagi, a high school student from Hakuou Academy who barely missed the top 16 double-elimination rounds last season by one win and one head-to-head tiebreaker. So far, both have been keeping pace with their performances from last season, which should mean that Nanoha would be the favorite to win this match. However, Nagi may have a few unpredictable tricks up her sleeve, meaning that if Nanoha isn't careful, we may be due for an upset. Will Nanoha continue her run in Topaz or will Nagi put an end to that dream? Last year, Ichinose Kotomi defeated Saber in Topaz 2 by a 3 to 2 ratio, but back then, Saber was not as strong as she is today. This time, both come into this match in a dead even heat. Both candidates are currently (11-1), (3-0) in Topaz, and their total votes gained and differential are just about even as well. Both candidates have also defeated opponents with an equal cumulative strength as well, and because of this, neither of these two can come into this match as a clear favorite. If there is one difference between these candidates other than their lifestyles and personalities, it is that only one will remain in contention for the Topaz Necklace. A win today will provide a huge boost in the Strength of Defeated Opponents tiebreaker, and with potentially stronger candidates coming up for both of them, neither can afford to slip in this match. It is a war between swordsmanship and classical music in Brazil tonight, and it is one battle you cannot miss. Durng Topaz 4 last year, an undefeated Nagato Yuki lost in a stunning upset to Kanon�s Tsukimiya Ayu, one of two major blemishes on Yuki�s career record. This year, Yuki has already redeemed herself by defeating both Ayu and Kawasumi Mai in Aquamarine, but to prove that last year�s loss was merely a fluke and not some sort of jinx, she will have to win her match in the Topaz 4 Match Set. Unfortunately, newcomer Aisaka Taiga is more difficult than last year�s Ayu. Despite taking part in her first contest, Taiga has adapted into the new surroundings quite quickly, and she has already proven that she can match the best candidates hand in hand. However, we have yet to know whether she can defeat one of the more successful candidates in the International Saimoe League. For one of these candidates, the radiance of the sun could flame out here. Can Taiga topple one of the Tier 1 candidates, or can Yuki actually win a match in this designated set? After a rough (4-5) start, Kawashima Ami is currently undefeated in the Topaz rounds and still has a slight chance to win the Topaz necklace. Sunohara Mei also started out (4-5), but has gone (1-2) in Topaz so far. Already you might be tempted to write Ami off as the clear favorite, but that is not exactly the case. Mei�s current record comes at the expense of a tougher schedule up to this point, and the total amount of votes received by each candidate is nearly identical to the other. Both are in a relatively similar situation in terms of airing as well, as the respective anime series each is representing recently finished their runs, and with both sides having a same-series candidate facing a critical matchup, both Mei and Ami should be able to benefit from the debris of votes that come their way. This could be set of Ami to be upset, but can Mei pull off a win that a recent Saimoe champion could not? With the recent rise of CLANNAD in 2009, Ibuki Fūko seems to be taking full advantage of it. 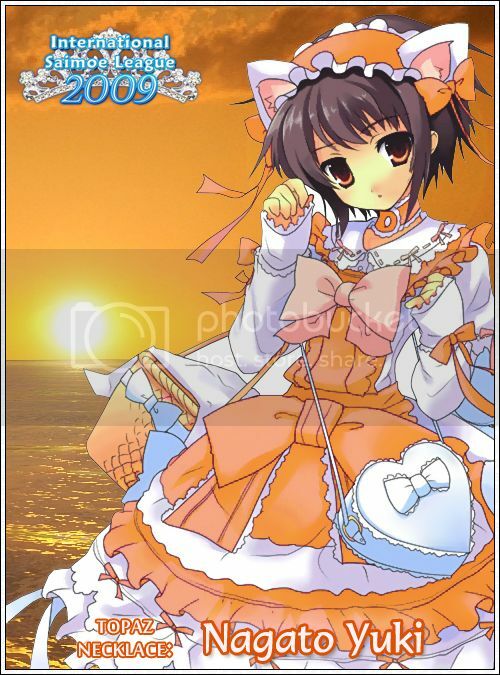 Fūko was ranked 26th in the final standings of ISML 2008, but she is currently ranked 17th in Topaz 4, even once taking 9th place, despite having a hard schedule with an SAO of 264. On the other hand, Rozen Maiden has been known to not do well in ISML, with the exception of Suigintou, that is. Even though Suigintou was ranked 13th in the final standings ISML 2008, she has so far underperformed slightly in 2009, currently ranked 21th. Will Fūko overcome her challenges and not be forgotten or will Suigintou take one step closer to becoming Alice? Find out in this heated battle that is sure to be very close. Two weeks ago, many would dare not to expect Kawashima Ami to remain in contention for a necklace by the midway point. Then again, not many expected the unexpected events that have already happened in Topaz so far. Ami has been running hot as of late, going as far as not succumbing to a loss since the near end of Aquamarine. In fact, her Topaz stats match Furukawa Nagisa's almost completely, meaning this match is far from an expected blowout. However, despite their total votes accumulated being equal at the moment, 5th-ranked Nagisa has been able to do it with a tougher schedule, backing her recent (8-1) Aquamarine performance, and defeating unexpected favorites along the way. Unless lightning strikes in one of the other matches, Nagisa will be facing two undefeated candidates at the same time, and therefore she cannot afford to lose. The path to the Radiance of the Sun will be cut short tonight. Can Ami pull an upset performance or will Nagisa take a huge step toward the top of the necklace standings? So far, both Kinomoto Sakura and Misaka Mikoto have eased themselves into (3-1) records for the Topaz stage, making this matchup worth looking at for the time being. Both have about the same average votes per match, but other statistics seem to tell two different stories. Mikoto is holding steady at the moment, so far not showing any surprises and managing a positive vote differential. She may be on route to secure a .500 record, but she needs to step it up a notch if she is to lock a spot in the top 16. A statement win is opportune here against the 2002 Saimoe Japan champion, who is just trying to get her vote differential back to the positive side after a humiliating defeat last Wednesday. Tonight, Mikoto is looking for a slight boost in the overall standings, while Sakura is looking to maintain her position just outside the top 16. It will be a close battle, but just which candidate will come out on top? So far, this has been a successful early season for both Illyasviel von Einzbern and Hiiragi Tsukasa, making the Istanbul match a mirror image of that in Tehran. Yes, both were indeed knocked out of the running by a handful of formidable opponents and are hanging around with a slight mathematical chance of victory. However, both are doing considerably well, finishing strong when they win, and coming extremely close when they lose. Similarities aside, Tsukasa has been averaging more votes than Illyasviel is so far, but she is also averaging more votes against her as well, making this match just about even in terms of possible strength. At stake here seems to be just a win, but losses can compile up to a lockout in this contest. The battle to decide who is the more moe candidate will commence tonight. Kushieda Minori couldn't defeat her best friend in Aisaka Taiga a handful of weeks ago, but today she has a chance to defeat an easier version of the Palmtop Tiger. Comparisons between Taiga and Louise Valliére have been evident since the Toradora! series began airing, making it more or less ironic that Louise is struggling to maintain a .500 pace as opposed to Taiga's top 16 run. Minori hasn't been doing that well either, managing only a (4-9) record in 13 matches. However, both candidates are averaging a fairly even number of votes received, and Minori's worse record could be just a result of her having a tougher schedule than Louise up to this point. If a technical upset is going to happen today, it may happen right here. Can Louise keep the .500 run going or will Minori find herself her fifth win of her young career? Furukawa Nagisa has been on quite a run since her decent but not outstanding performance last year. She hasn't lost since Aquamarine 3, when she took on Suzumiya Haruhi only to come up short, and her victories included major unexpected upsets and triumphs over surging newcomers and veterans alike. Her recent win over Kawashima Ami has nearly catapulted her to the top of the Topaz Necklace Standings, and a win over Shana today could easily clinch Nagisa the top spot for at least two days if not the whole period. Despite this, Shana comes into this match as the favorite, as she averages more points per match, and with her SDO tiebreaker lacking in depth at the moment, she needs a win here to solidify a chance at Topaz. One of these candidates will fall a second time and lose a realistic chance at the Topaz Necklace. Could Nagisa pull the upset over Shana or will the flame haze scorch the dumplings tonight? The only other Topaz undefeated matchup takes place in Madrid, where Nagato Yuki will face Takamachi Nanoha for a second time. The last time these two have faced off, Yuki defeated Nanoha 334-299 in Ruby 3 last year, and recent history, statistics, and performance shows that Yuki is the odds on favorite to win this match, especially with about a two hundred average votes received advantage over Nanoha. Certainly, Yuki will not go easy on her as she wishes to rectify her (7-2) Aquamarine performance, but Nanoha might not go down easily. Sure, Nanoha did have one more win than Yuki in Aquamarine, but so far in Topaz, all of their non-vote tiebreakers are equaled at the moment, and Nanoha's lower vote differential suggests that she is struggling to defeat opponents at Yuki's pace. All that may not matter, as surprises usually always happen in this league. Someone loses sight of Topaz tonight. Which candidate will deny the other a chance at her first necklace? What should have been an undefeated matchup, had it not for Ichinose Kotomi's loss to Saber, has turned into a rather difficult survival match for Katsura Hinagiku. Kotomi and Hinagiku actually met twice before, once in Topaz last year and once more during the Tiara Double Elimination phase. In both occurrences, Kotomi convincingly outlasted Hinagiku, and if history repeats itself tonight, Hinagiku could be knocked out of the running for Topaz before she has a chance to take on Fujibayashi Kyou for a much anticipated rematch. However, keep in mind that last year, CLANNAD was fairly recent and taking part in its first contest only to produce outstanding results, while Hayate no Gotoku! ended just before the regular season started. Today, the converse is true, as CLANNAD's run is officially finished save for a handful of upcoming OVA's while the second season of Hayate no Gotoku! is currently airing. But as a reverse pull can only do so much, neither candidate comes out as a clear favorite here. Could the school president lose her shot at Topaz, or could she finally get a win over the harpsichord violinist? Believe it or not, "10-4" could defeat a (14-0). It is unlikely to happen however, but Fate Testarossa is statistically the weakest of the four remaining overall undefeated candidates. Her points accumulated are almost similar to that of Sakagami Tomoyo, but her voting statistics are the lowest of the four undefeated candidates, and she does not even rank in the top 10 in terms of votes accumulated. This could be a perfect time for last year's #16 vs. #1 matchup to take shape in the other direction. Hiiragi Tsukasa hasn't been known to take advantage in the necklace periods due to early losses per period, but she has shown that type of consistency that enables her to win on a consistent basis, one you would find in a borderline top 16 candidate. Add to the fact that she finished second in Saimoe Japan last year and couple that with Fate's less than dominating performances and there is a slight chance of an upset. Could Fate stay undefeated for long or is this the time for yet another shocker? A handful of people, ranging from candidates to officials to voters alike, were shocked when Saber remained in contention for the Aquamarine necklace up to her match against Fate, calling a possible victory one of the most upsetting performances of all time. To her credit, calling her performance at this moment an "upset", despite her 20th place, (43-19) performance last year, would be unfair, as Saber is currently undefeated in the Topaz period once again with a realistic chance to take part in the Topaz coronation ceremony. All she would have to do, other than barring an upset and finishing strong, is to take care of one more major obstacle that stands in her way. There is just one problem, however: Fujibayashi Kyū has backed up her (58-4) performance with an undefeated campaign � overall � so far, and she has never lost a Topaz match in her career as of yet, and after losing the Topaz necklace to a candidate who is non-existent this year, Kyū is looking to take what she feels is rightfully hers. The Radiance of the Sun is at stake here. Can Saber hand Kyū her first loss and secure a likely (9-0) campaign or will Kyū remain undefeated for a second chance to claim Topaz? If there is a candidate turning a surprisingly shocking performance into Topaz eligibility, it is Asahina Mikuru. Despite being the only SOS Brigade member to have no athletic ability whatsoever, this particular time-traveler has already improved her (5-4) performance in Aquamarine, and now has a legitimate shot of actually taking the lead in the Topaz standings after defeating Kawashima Ami, who was the surprising candidate on the rise in Topaz prior to her loss in Topaz 5. However, continuing that run tonight will be difficult, as Mikuru faces '08 Aquamarine winner Shana tonight, and you can be sure that Mikuru's friend Suzumiya Haruhi wants Shana out of the Topaz running before the final showdowns this Friday. However, Shana is looking to take her second necklace, and despite facing a candidate who has improved since their respective match last year, she cannot afford to back down as her current SAO tiebreaker is suffering from a weaker schedule than she is used to. With only one loss in her overall campaign, Shana is ranked second in terms of most votes accumulated, and her usual dominating performances against up and coming contenders make her the favorite in this match. The road to radiance ends tonight for one of these candidates, but will Mikuru continue playing the role of Cinderella, or will Shana be on her way to her first (9-0) campaign of the season? Tonight, Dhaka gets treated to yet another out of 18 CLANNAD vs. Hayate no Gotoku! matches that will take place this season, and if anything, this match could be treated as a continuation of the thrilling Ichinose Kotomi vs. Katsura Hinagiku match. This time, not so much is on the line � there are no undefeated records at stake, but the rivalry between Ibuki Fōko and Sanzen'in Nagi is perhaps more intense than that of Kotomi/Hinagiku. Nagi knows good and well that losses do compile as the season progresses, and the difference between becoming part of a revelation like no other and standing on the balcony looking to the sky can hang on one point within a match. Last year, Nagi was one win shy of making the top 16, and she knew that had she won any of the matches she lost, she could have made the postseason double-elimination tournament. So it doesn't help that Fōko beat Nagi last year in Sapphire 5 � by two votes, a difference that may as well insured Hiiragi Tsukasa's position as the 16th seed last year. Now Nagi is looking to settle the score, but she will have to do it against perhaps a stronger starfish familiar than last year, as Fōko has racked up more wins than Nagi despite a tougher schedule to this point. It is doubtful the differential margin in this match could even break 200, so this is one match you cannot miss. Both Maria and Suiseiseki are (4-2) in Topaz so far, therefore eliminated from Topaz contention, but this match could be of crucial importance, as both of these candidates are barely on the edge of the .500 borderline. Maria started off with a dismal (4-5) run in Aquamarine, but a momentum shift thanks to the currently airing second season of Hayate no Gotoku! has worked well into her favor, as she has so far finished her matches with an average of about 650 more votes than her opponent. Suiseiseki, however, could be on the verge of losing momentum, as inactivity with the new Rozen Maiden manga series due to injury has put the Princess of the Desu meme in such a bind. Both have had success in Korea Super Best Moe, with Maria scoring a 4th place finish in 2007 and Suiseiseki following her unbelievable '06 campaign with a 2nd place effort in 2008. That success hasn't transpired much to this tourney, and if both want to at least have a good chance of coming back next year for another shot, both need to stay above .500 by consistently winning as much as possible. Could one of them be on the brink of an unexpected downfall? The Topaz 8 match set is full of lackluster matches, and for many of them, the outcome is virtually predictable. In fact, many candidates are already looking forward to their respective matches on Friday, as what could be their fiercest matches in this period could take place then, and with the final eight undefeated candidates in Topaz facing each other, Friday's match will be hard to ignore. However, for this match set, one matchup is up in the air. Misaka Mikoto is currently the highest ranked preliminary-qualified candidate not named after an animal, and after already completing a quarter of the schedule, ten wins is already impressive. However, she hasn't been as challenged as Suiseiseki, who has nine wins at the moment but a tougher schedule to back those losses. According to their recent performances so far, it is difficult to tell who the favorite in this match is. It's a battle between Earth and Lightning � just which of these two will prevail? After starting Aquamarine off (4-5), then winning her match against Kamio Misuzu just to get back to a .500 winning percentage, Sunohara Mei dug herself into a deep hole by losing four matches in a row right afterward. So far, she has won her last two, and is looking to put that momentum into good use by defeating a formidable opponent in Holo, the winner of 2008 Korea Best Moe. However, it will be very difficult task, as Holo is on a (6-1) Topaz run after finishing a mere (3-6) in Aquamarine. Clearly, Holo has a distinct advantage here, and with no other critical matches involving CLANNAD characters, Mei could have a little trouble not only pulling off an upset but returning to the winning side. Is an upset looming in the distance or will Holo turn her outstanding run into a berth into double-elimination? Tsukimiya Ayu is currently the highest ranked Kanon representative, but standing at 6 wins at this point in the season could mean that Kanon, who has landed four candidates over .500 last year, could officially be falling to the wayside, and with no new material to cover (but a lot of material for CLANNAD), it is quite possible that we could be seeing the last of an extraordinary series of its time. So with the Higurashi franchise currently airing the Rei OVA, a (10-6) Hanyū is a complete mismatch for Ayu. However, to Ayu's credit, she has won the last meeting between these two, winning 252-184. Therefore, a technical upset could possibly happen, although Hanyū is heavily favored to even this series. Can Ayu avoid that and pull one of the more notable upsets in history? During the preliminary rounds, Touhou had been making a lot of noise, safely securing all five of their candidates in the official ISML roster in dominating fashion, leading many to believe that they would virtually dominate the top half of the leaderboard. Just shy of three months later, it has been the flip side of the coin for them, with only Hakurei Reimu barely on the .500 borderline so far. However, lower voting turnouts usually lead to close matches, and despite lacking marquee status that higher ranked matches have, lower ranked matches are usually unpredictable. For this match in particular, it will be interesting to see where loyalties lie, as Remilia Scarlet at least has a substantial chance to attain a .500 record, leaving Shameimaru Aya with one of the worst performances a candidate can possibly attain. However, we have seen that in inter-series matches, the candidate with the better record doesn't always win. Which one will attain at least another victory tonight? The period known as the Radiance of the Sun has produced many amazing matches, and with those come some of the most surprising of candidates making an unthinkable run at Topaz. When it was all said and done, only the eight candidates that were projected to be in the top tier remain, and all eight of them will collide with another in what will be one of the most critical matches to be held this season. Yet, what looked to be "anybody's game" before Topaz 8 now looks to be a runaway, as falling candidates and rising stars have left Hiiragi Kagami putting a stranglehold on the remaining candidates in terms of Topaz eligibility. In fact, barring special circumstances, all the '08 Amethyst winner will have to do is get past '08 Aquamarine winner Shana. If you recall from last year, Kagami defeated Shana in her Amethyst run by only 7 votes (246-239), and had that match gone the other way, who knows what would have happened. Shana remembers this clear defeat, and despite the race to Topaz being almost entirely out of her hands, she can still look to settle the score and redeem herself from that misstep from a year ago. As many candidates need Kagami to lose in order for Topaz to fall the way, this match will be the one to watch for tonight. Can Kagami seal the deal and compliment her luminance or can Shana soil her chances with a well-timed victory tonight? Seoul, Korea is the home of Korea Best Moe, the moe contest that holds the record for the largest international voting turnout, and it has played host to some of the most breath taking matches we have ever seen, ranging from unexpected upsets to close calls to even draws that knock uninvolved candidates out of the next round. Both Nagato Yuki and Sakagami Tomoyo know full well how hectic Korea Best Moe could be. Yuki was involved in three matches where the margin of victory was extremely close, two of those being near losses to Suzumiya Haruhi in both '06 and '07. Tomoyo was involved in an epic battle against Mizunashi Akari that resulted in an unsettled 5183-5183 tie, stirring up a huge controversy not long afterward. Tonight, Seoul will play host to a matchup that has had some history on its own; last year when these two met in the early season, both were ranked #1 and #2 respectively, and the match went into overtime before Tomoyo eventually came out as the victor. At stake tonight is the Topaz Necklace, where one loss could guarantee a complete lock out from the Radiance of the sun, but it could be more monumental than that, as while Yuki could be knocked down with her third loss, putting her out of position from a top 8 ranking, a loss by Tomoyo will mean surrendering the privilege of holding the top record in the standings throughout ISML history. Someone will prevail tonight. It is only a question of whom. Mexico City plays host to the only undefeated matchup that has not turned into a huge rivalry, but that is not to say that this match does not have any significance. Despite the fact that both will most likely need Kagami to lose to Shana in order to have any significant chance at the Topaz necklace, both are also undefeated overall so far, meaning someone could walk away with their first loss for 2009. For this match in particular, the current Tiara bearer Fate Testarossa will take on Suzumiya Haruhi, winner of both Ruby and Diamond last year after closing the season on a spectacular note. However, that is not to say that there is intensity between these two candidates. Fate defeated Haruhi last year 375-346, and while the margin may not be as close as the many ridiculous overtimes from last season, that also happened to be Haruhi's final loss of the 2008 regular season, and that could have possibly set off the spark that enabled her to go on such an amazing run, one that ended in a 1-point loss in a postseason on what could have been an otherwise immaculate run. Now that one year has passed, Haruhi will try to defeat Fate, who may not be known to defeat opponents with authority, but she can win when the situation calls for a win, margin outstanding, and if a statement is needed to be said, the time is definitely here. Which one of these candidates will find their first loss of the year? The only stipulation keeping these two candidates from headlining their already intense rivalry is that despite both candidates being undefeated in Topaz, both Katsura Hinagiku and Fujibayashi Kyō must depend on Shana to defeat Hiiragi Kagami for either candidate to have a shot at the necklace, and for Kyō, a win by Sakagami Tomoyo over Nagato Yuki is required as well. In other words, both candidates are a long shot to win Topaz, but that alone should not overshadow this particular match. Last year, in the first meeting between these two, the match went into overtime 300-300, and Hinagiku barely scraped away by 11 votes in the overtime match. That wasn't the whole story, however, as Kyō not only pulled this rivalry to even in Korea Best Moe 2008, but she defeated Hinagiku in the semi-finals, 4332 to 3880, and denied Hinagiku the chance to defend her crown in that tourney. Tonight, Kyō comes into this match undefeated overall, but she could have a tough time defeating Hinagiku, who may not have reached her full potential given that Hayate no Gotoku! is airing a second season AND is very close to a story arc centered around her. The grounds of Shanghai will feel a rumble tonight as someone tries to pull this storied rivalry to a (2-1) advantage. Will Kyō find her first loss of the season or will Hinagiku stumble with a second loss?